1 As you work on this lesson try to find os many Americanisms in spelling or vocabulary as you can. • the names of places in New York. • the names of New York's main attractions. • the name of the river in New York. Let's do Manhattan.— Давайте осмотрим Манхэттен. Emily: What would you like to do today, guys? and the Chrysler and the Pan American buildings. Rob: I agree with you. Skyscrapers are really interesting. Let's go for a walk and do some sightseeing. Mark: And I'd like to see Central Park. Emily: Well, we don't have too much time. Let's do the main part of Manhattan today. It has a lot of attractions and you'll be able to get a good first impression. If we don't have enough time for Central Park, we'll do it tomorrow. and consists of five boroughs: Manhattan, Brooklyn, Queens, Staten Island and the Bronx. Emily: You're right, Mark. We should see them all, but Let's take a look. 4 Emily's are looking at the fliers. Look through the fliers and answer the questions. 1. What places of interest will the friends probably see? 2. How are they going to travel? 3. What theatre will they probably go to? Find the Big Apple's mega star — The Empire State Building, which became the tallest skyscraper in New York on September 11, 2001 (the Twin Towers of the World Trade Center used to be higher). "There are many apples on the tree, but only one Big Apple". The old saying is very true when we talk about New York - America's Big Apple. We can offer you a cheap, fast and easy way to see it all. Buy a MetroCard at any subway station and the key to the city is in your hands. MetroCards can be bought on a pay-per-ride basis ($1.50 per ride) or an unlimited ride basis. With pay-per-ride, you get 11 rides for the price of ten. These tickets can be used by groups of up to four people. With unlimited ride MetroCards, you can get a 30-day card for $63, a 7-day card for $17, or a one-day Fun Pass for only $7. These tickets are not transferable. 5 Write the nomas of the attractions and places you see in the photos. 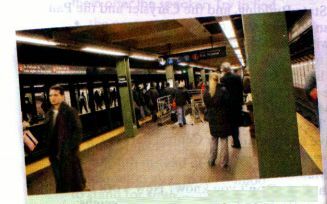 6 Look through the MetroCard flier and answer the questions. 1. What ticket should friends buy for their day out in New York? 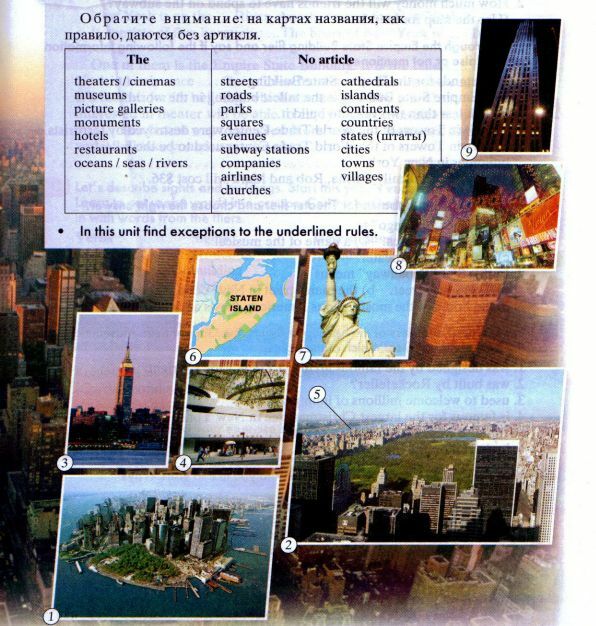 7 Look through the Empire State Building flier and say if the following information is true, false or not mentioned. 1. 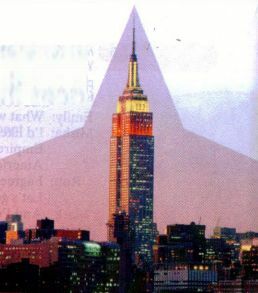 ESB stands for the Empire State Building. 2. The Empire State Building is the tallest building in the world. 3. It took less than two years to build it. 4. The Twin Towers of the World Trade Center were destroyed by terrorists. 5. The Twin Towers of the World Trade Center used to be the tallest buildings in New York. 6. The tickets for Emily, Misha, Rob and Mark will cost $36. 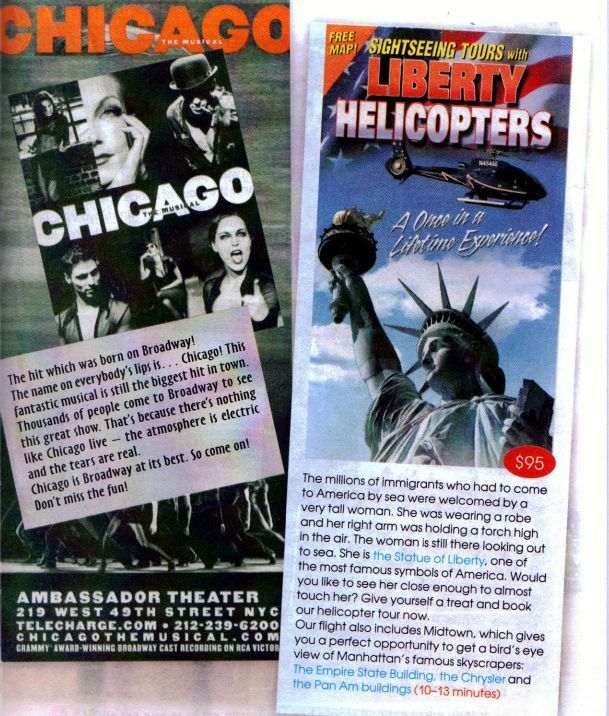 8 Look through the Ambassador Theater flier and choose the right answer. c) a name of the theater. b) the main street in New York. c) the home of the most famous American shows and musicals. 1. was designed by the famousarchitect Frank Lloyd Wright? 2. was built by Rockefeller? 3. used to welcome millions of immigrants? 4. is famous for the largest Christmas tree in New York? 5. contains a collection of modern art? 6. looks out on the sea? 10 Which places of interest in New York would you like to visit? Why? 11 Try to guess: Which sights did the friends actually visit? What did they decide not to do? Why? 12 Listen to the speaker and check your answers. A Imagine that your friend has visited New York. Write ten questions about the city that you would like to ask him / her. В Use the information from the fliers, fill in the gaps and complete the notes. Be careful with the articles. New York is on the ... River. Another name for New York is ... . 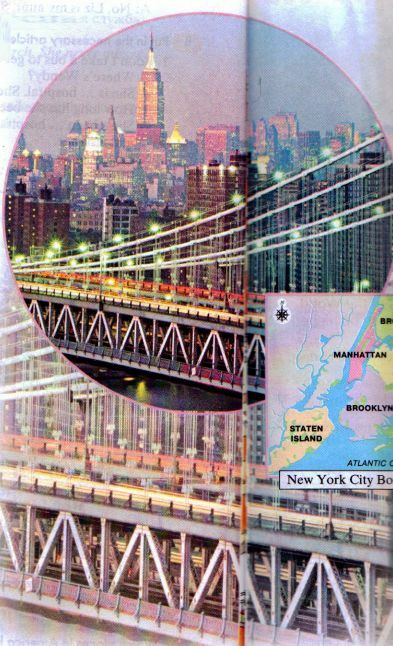 It consists of five boroughs: .. .The heart of New York is .... It has a lot of... .
One of them is the Empire State Building. 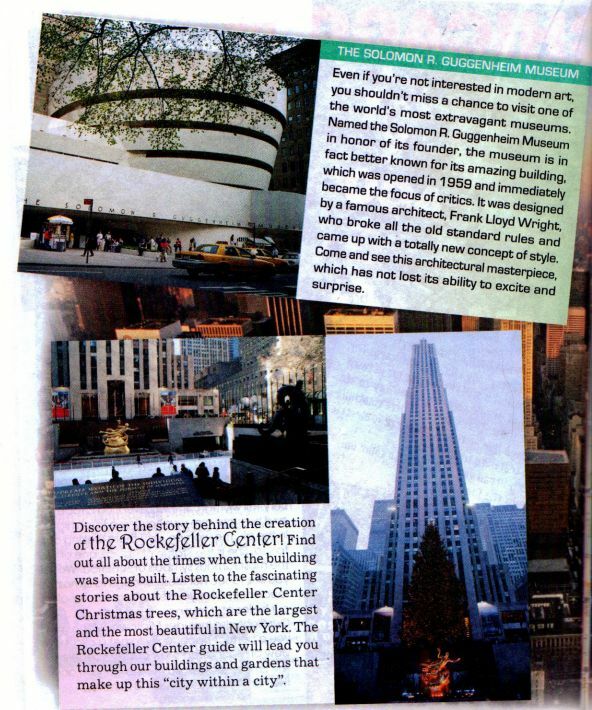 It is the tallest ... in New York but only since .... One of New York's most famous museums is .... It's famous for its building, which was designed by ... . Those who are interested in theater will be able to enjoy different musicals and shows on ... . The fastest way to see New York is by ... . You need to buy a ... and it will take you all over the city. С Let's describe sights and buildings. Start this year's vocabulary. Learn to put useful words into groups. Copy the scheme and fill it in with words from the fliers.